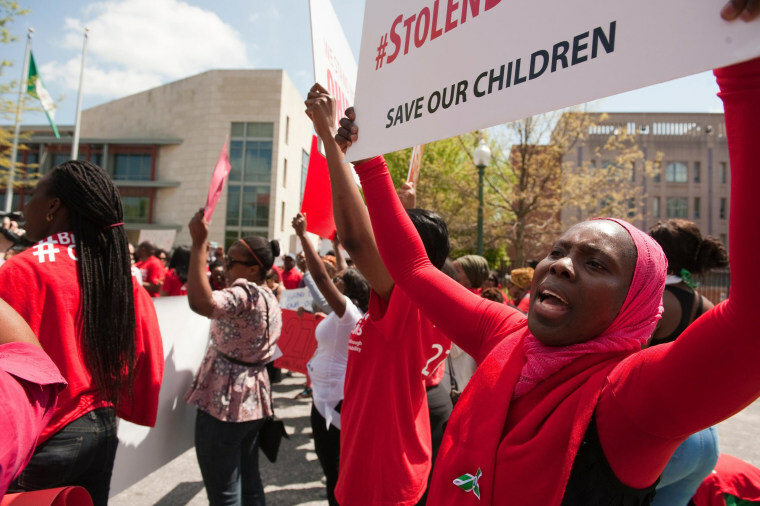 As weeks have passed, #BringBackOurGirls has reverberated on social media and rallies have been held in cities around the world. The U.S. confirmed Tuesday it was sending assistance and the U.K. has offered help as well. Nigerian police later announced a $300,000 reward for information on the girls' whereabouts. Here’s a look at the conditions that led to the kidnappings and the challenges around rescuing them. Boko Haram’s violent tactics are nothing new. The group - whose name means “Western education is sinful” - has been waging a bloody campaign in northeast Nigeria for years, destroying churches, kidnapping scores of people and burning down schools, sometimes with the students locked inside. "If an act like this brings attention, this is what you have to replicate or top to bring more attention"
Boko Haram’s brutal methods landed them on the State Department’s list of terrorist organizations and the U.S. government has offered a $7 million reward for information on leader Abubakar Shekau’s whereabouts. The group has been blamed for more than 1,500 deaths this year alone – but the schoolgirls’ kidnapping clearly has touched a nerve – which could encourage Boko Haram to carry out similarly brazen attacks. The rescue operation faces numerous challenges, not least of which is the damage caused by passage of time. “International attention to this has caught on very late and it’s perfectly possible that it’s now too late to get the whole group back,” Pantucci said. Experts believe the girls have been split up into smaller groups and moved into forested parts of the area where Boko Haram knows the terrain and has the upper hand against security forces. "It could be years – if not decades – before all of the girls are accounted for"
Boko Haram's leader, Abubakar Shekau, has threatened to sell the girls in the market; he could also distribute them as gifts or rewards to Boko Haram’s expanding membership. “It could be years – if not decades – before all of the girls are accounted for,” said Jacob Zenn, analyst of African affairs for the Washington, D.C.-based Jamestown Foundation. Paying ransoms for the girls – which in recent years have yielded millions for terrorist outfits such as Ansaru, a Boko Haram splinter group – would be fraught with complications, given that any funds turned over would likely be pumped right back into arms and weapons for the group to carry out similar attacks. There’s also the grim fact that many hostages have died in botched rescue attempts, and the possibility that Boko Haram also could use the schoolgirls as human shields. If the girls have been separated into small groups – as many experts suspect – that would mean Nigeria’s security forces could be looking at dozens of separate rescues, a daunting prospect for the country’s military. While the international community has long urged Nigeria’s president to do more to choke off Boko Haram, the fiercely sovereign country mostly has insisted on going it alone – until now. The Nigerian government’s military strategy has largely been about containing Boko Haram in the northeast, according to Pantucci. President Barack Obama told NBC News’ Al Roker that Nigeria has accepted the U.S. offer of help from military and law-enforcement officials. Secretary of State John Kerry said that a joint intelligence cell would be set up at the U.S. embassy in Nigeria and would begin work "immediately." Boko Haram has, by some estimates, several thousand members armed with everything from rocket-propelled grenades to anti-aircraft missiles. “It’s like fighting a militia or a fairly small army,” Zenn said, pointing to recent attacks that showed sophisticated planning and organization. “Boko Haram knows the terrain in the northeast and has sophisticated weaponry, including tanks, to do battle with even the most sophisticated army,” Zenn said. "He's finally gotten placed on the world stage and this is his time to act"
Nigeria’s military has thus far been unable to control the areas of the country where Boko Haram runs rampant - and the measures it has taken have come under fierce criticism. The security forces have been accused of heavy-handed tactics against suspected militants, and the United Nations warned that the military may have committed human rights violations in its attempts to neuter the organization. That heavy-handed approach could be helping Boko Haram attract recruits because some northerners fear the military as much as the militants. All of the attention focused on the kidnappings could have an unintended consequence: giving Boko Haram – and its leader – a public relations boost. After years of calling out to al Qaeda and taunting world leaders from Barack Obama to United Nations Secreatary-General Ban Ki-Moon, the outcry over the kidnappings has finally put Shekau in the spotlight. Zenn said that Boko Haram’s recent claims of responsibility for attacks outside its traditional northeast stronghold demonstrate that Shekau has more resources at his disposal – and is not afraid to use them. That could mean bombings in Lagos or Abuja, like the one Boko Haram claimed responsibility for last month. Nearly six dozen people died in that attack. Or, he might revel in his new-found profile and dare the U.S. to take him on. If the U.S. takes the bait, it could push more al Qaeda sympathizers into Shekau’s corner by painting him as a defender against an American invasion – and boost his stature within terror networks.